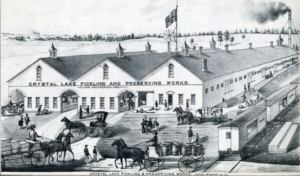 The Crystal Lake Pickling & Preserving Works was perhaps one of the largest institutions and greatest enterprises in McHenry County in the late 1800’s. It also proved to be one of the most disastrous speculations ever engaged in! In 1872, the company was formed and chartered by the State of Illinois as an Agricultural Society, with Josiah Walkup, President, and R.G. Benton, Secretary. They entered into an agreement with Wm. Archdeacon, of Chicago, to raise $150,000 and erect a large pickle processing plant. Archdeacon had operated a successful pickle processing plant in Chicago, but it was destroyed by the great Chicago fire of 1871. The plant was erected on land owned by Josiah Walkup, who also owned much of the surrounding acreage. The land produced the cucumbers and fruit which were then sold to the plant for processing. The business, at first was very successful. 55,000 bushels of pickles were processed by the plant in the first year. The plant employed 200 workers. In addition to pickles, the plant also processed sauerkraut and canned fruit. Three years after operations started, Archdeacon convinced his partners that a large sum of additional money was needed in order to continue operations. A joint stock company was formed with a capital of $300,000, and Archdeacon was made president. The Crystal Lake Pickling & Preserving Works did not run long under this organization when Archdeacon succeeded in having the property deeded to himself in order to use it for collateral. He soon mortgaged the property to F.A. Waidner, of Chicago, for $100,000. When the mortgage came due, Archdeacon could not pay off the loan, and so the property was surrendered. This closed the history of the original Crystal Lake Pickling & preserving Works. The machinery was sold out of the building, but building remained and stood empty for many years as a monument to bad management and financial loss.